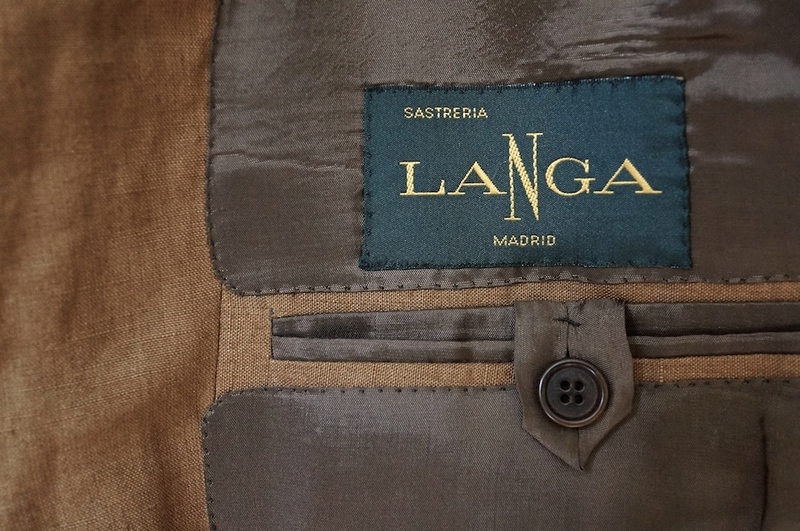 Some close-up details here on the linen suit from Sastreria Langa that we featured earlier in the week. You can see a few of the tailoring idiosyncrasies, as well as the cloth and work itself in more detail. 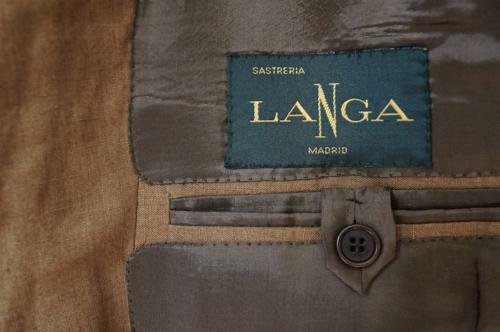 Langa include both a label for their own brand and one describing the cloth on the inside of the jacket. 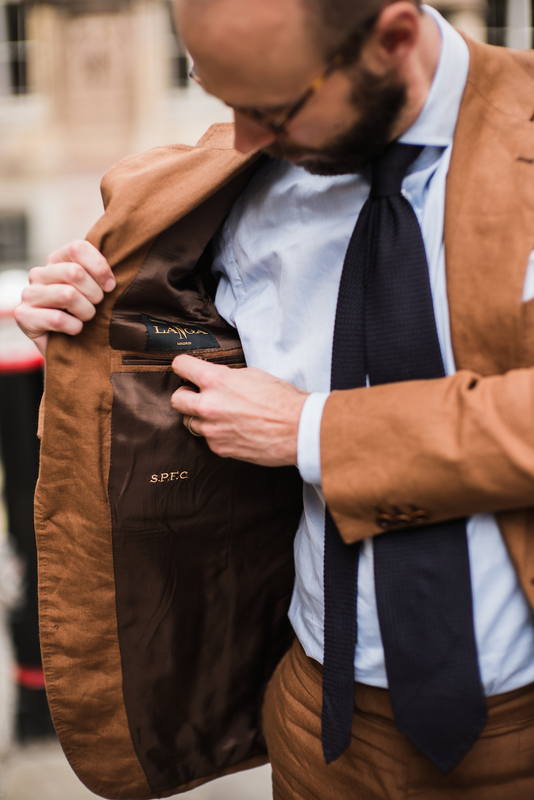 I’d prefer to not have the former, but can live with it, while the latter is worth avoiding – it stems from an assumption with smaller tailors that the cloth merchant is more prestigious than they are. There are also embroidered initials, which are decently done. One shortcut with the make is the insert around the in-breast pockets, which can be seen in the close-up at the bottom of this post. The cloth is cut, rather than continuing seamlessly around the pocket, which is a lot easier to do but a little bit of a shame aesthetically. That image also shows the top stitching on the lining around these pockets. It’s nice to have this by hand (most English tailors don’t bother) but it is a little wobbly in places. On the image of the trouser’s side strap you can see that the lining of the waistband is attached by machine. This is a peculiarity, as I have yet to use a tailor that does this by machine. 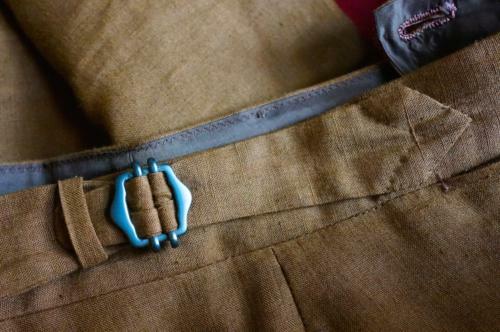 Even the cheaper tailors like Graham Browne tack this by hand, considering that it makes the waistband more comfortable. A bigger issue is the side strap itself, the length of which makes it prone to slipping. A shorter strap can hold the cloth underneath it more easily, and that’s particularly needed on linen. You can also see that the strap has a little keeper on the left, which isn’t particularly well placed – it covers the strap and makes it hard to pull. On the plus side, the pointed design and handwork around the points is attractive. Elsewhere there are some nice touches. The swelled edges around the lapel and out-breast pocket are well done, and there are two neat change pockets on the trousers, just under the waistband. As with the style and fit, discussed in Tuesday’s post, there is room for improvement here but it remains a very good-value suit. You can follow the discussion on Linen suit from Langa: details by entering your email address in the box below. You will then receive an email every time a new comment is added. These will also contain a link to a page where you can stop the alerts, and remove all of your related data from the site. Is it standard on high end bespoke that the inside Pocket is inserted With the cloth, and not the lining? I have a SR suit which has the Pocket cut in the lining, not the cloth, but perhaps that was a shortcut by the tailor? Thanks Simon. Have you observed a difference here between the various SR houses? How is this done on your A&S suits? I understand that they also only jet the Pockets in the lining? My apologies, ignore the comment above about cutting into the cloth – I was thinking of French tailors not English. All the SR suits have the pocket cut into the lining (A&S, Gieves, Poole, KH&L etc). The difference in strength is minimal, but I do think the point in the post is important – if you’re going to run the cloth around the pocket, it’s a shame aesthetically to cut it. Cifonelli etc don’t. Quality of tailoring aside, I think you’ve knocked it out the park with this suit. I’ve got a Smedley jumper in a similar colour and I love it… I could wear it to death but I love it too much. This suit is full of good decisions. That tie knot looks like the sort sported by an absolute bounder. It appears the spiv look is returning. I think that the initials musn’t have points between them. For example, Louis Vuitton isn’t L.V. Sorry to go off topic but I was wondering, if Graham Browne is the cheaper end of tailoring then who is the middle ground before getting to Savile Row? The only ones I recall you mentioning between the two in price points are non-English tailors. There isn’t anyone really… Except that the likes of Kent Haste & Lachter, Steven Hitchcock and so on will charge just over £3000, rather than most SR houses that are over £4000. But there’s no difference in the quality level. I am not sure about wearing a grenadine tie with a linen suit. To me, a grenadine is just to “heavy” for this rig; knitted silk might be a better choice. Two quick questions, did you make the sleeves and trousers longer to take account of the shortening effect that the creases in linen create? Also would you expect to occasionally run some steam through the suit to get the big creases to fall out or would you have it pressed regularly ? Yes, there was a small allowance for the creasing, but only a small one. You need to allow for it being less creased as well, obviously. 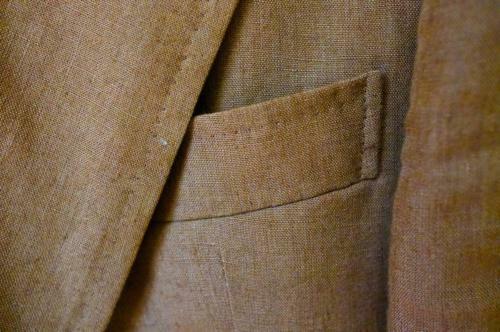 Tobacco brown is a great colour for a linen suit: I’ve been wearing mine to death last 2 years. I think with linen, for me, more than with other cloths the weaver and the dyer are critical and there’s still few who are as good as those from Northern Ireland roots; they may be spinning and weaving somewhere else but it’s the skills they have running through their factories that makes the difference look at Baird McNutt as a great start point. Have yet to try an untipped grenadine, so thanks for the thought. Tobacco coloured linen is a great look. But present wonderful value. Just for the record. There pockets are set in the jacket fabric. Looking at the finish of this suit and comparing to some of GBs I must say that GB’s are not far (if at all) compared to Langa. Maybe I have just been lucky, but everything from side straps to inside pockets seems at least at par with this suit judging from the photos. How does it compare with your GBs (I know Russel and Dan have lately taken some steps to have more handwork and better finish which may have something to do with this). Hi Simon, sorry to go ‘off topic’, but I see that Hilditch & Key are having a second Summer sale (the first was in August) with some RTW shirts at £30! I have had some MTM shirts from H & K which offer good value and fit well, however I am worried that this level of discount at this time of year may mean they are in financial trouble and the ‘no answer’ I received when I rang them this week worries me further. Have you heard anything or are they just ‘restructuring’? Love the colour Simon. Off topic but I see the offer of a newsletter coming up in a box… it would be good to know purpose and content and will the e-mail addresses be shared with anyone? Some comments have touched upon SR and cost, I have been reading about Dimi Major (tailor for the Bond OHSS). His son continues in Fulham at supposedly good prices, I wondered whether you had ever visited. Sean Connery and Ronnie Corbett used Dimi out of choice so he left a fine and stylish legacy. Found this website just yesterday and have been gulping down the archive relentlessly since! One quick question: i am moving to a tropical city where the temperature is usually upward of 25 degrees year round. I am 21 and trying to up my style game by commissioning a lightweight sport jacket. What would be a good idea for a versitle casual jacket in terms of fabrics, cut and construction? Thanks so much! Great fan of your materials, incredibly insightful! Pardon my off topic question: what would you suggest for a lightweight casual jacket that can be worn in the tropical climate (upward of 25 degrees) in terms of cut and fabric? Versatility is of course important but im willing to try something bold. Thanks in advance! What is your opinion on solaro fabric? Sorry, this is squarely an off-topic query. I just want to know whether wearing Black shoes at night – I mean at parties and events other than strictly formal ones – is a matter of esthetic or propriety. For instance, what about midnight blue or dark burgundy oxfords on such occasions? I am picking up my long awaited bespoke dinner suit in the following week and need to obtain an equally nice satin-silk bow tie and cummerbund. In regards to a bow tie, I am a fan of a larger bow, rather than a small, modern attempt on one. 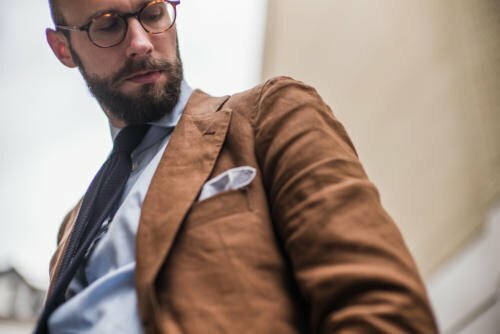 I would be very grateful if you could attempt to point me in the right direction on this matter, so far companies such as Drakes and Favourbrook are on my radar, but any more unique, specialist and even better quality items would be appreciated. I’m planning a few trips to Madrid and found your articles about the 3 spanish tailors in Madrid. These guys seem to be the best Madrid has to offer. Do you happen to have any insight to other tailors in Madrid that maybe a tier down in price? No cheaper ones, no sorry. There are a couple of other high-end ones that are good. Langa is pretty cheap though – you’d struggle to find much that’s quality and cheaper. Firstly, thank you for your blogs, which I find immensely engaging and informative. Second, I am intrigued that every photograph that I see where trousers are shown, there are always back-pockets. I find them a bane; I never use them because they spoil the line of the trouser when they are used, the lining can ride up or fold no matter how carefully I dress, so I wonder why people persist in having them? I would like to read your response, particularly if you believe they do suit a purpose that I hadn’t considered. Please keep the articles coming. They are fascinating. That’s a useful insight; I hadn’t balanced the aesthetic element against the pragmatic but I take your point. Thank you. Fantastic blog, where has it been hiding all this time? I’ve a very similar coloured linen jacket (no trousers) en route, unfortunately cannot afford bespoke yet. What sort of trousers (colour/ material) do you think this would go with? Ideally to dress it up and down. New regular reader in the making. Cheers. It has been around for nine years but we don’t do much publicity!